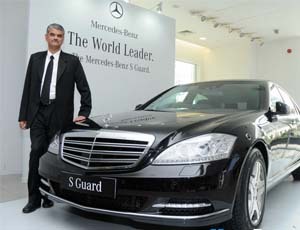 DELHI – Mercedes Benz India reported a 27 percent increase in sales on Tuesday, with more than 2,500 units sold in the first quarter of 2014 in comparison to 2,000 during the same period last year. According to some analysts, the German luxury car maker’s high Q1 sales indicate a growing taste for luxury items among India’s middle and upper classes. “The size and wealth of India’s domestic consumer market has often been overlooked as companies and the media have focused on China. These figures show that the Indian middle and upper class consumer market is buoyant, sizable and has significant disposable income,” commented Chris Devonshire-Ellis, founding partner at Dezan Shira & Associates. “India cannot and should not be ignored as a consumer market for foreign brands,” he continued. In recent years, India has become one of the most dynamic and rapidly growing luxury goods markets in the world, with Euromonitor International projecting a growth rate of 86 percent between 2014 and 2018. India’s projected growth rate during this period is followed by China’s at 72 percent, Brazil’s at 31 percent and Russia’s at 28 percent. In India, citizens with more than US$1 million in offshore assets grew 200 percent between 2006 and 2013, and households with an annual disposable income exceeding US$100,000 grew 60 percent from 700,000 in 2006 to over a million in 2013. In 2012, India’s luxury market reached a value of US$6 billion, with vehicles (US$2 billion), personal luxury goods (US$1.5 billion) and premium hospitality (US$1 billion) leading the pack. If India’s luxury vehicle market is any indicator of what’s to come, things will soon be looking up for luxury brands in all industries. With LMC Automotive projecting luxury car sales will increase from 26,000 to 84,000 units between 2013 and 2020, Indian consumers are not only buying more luxury vehicles, but also reporting higher after-sales satisfaction. “An increase in the number of luxury models available in India, coupled with attractive financial options that enhance affordability, have really helped the luxury market grow,” said Mohit Arora, executive director at J.D. Power Asia Pacific. “With customers paying more for luxury vehicles, they likely have higher expectations during the sales process. The price of luxury vehicles is significantly higher than the price of mass market vehicles, and customers expect luxury brands to provide a truly differentiated experience to enhance the value of ownership of these vehicles,” he added. Luxury sales satisfaction in India averages 873 index points on a 1,000-point scale, 32 points higher than the mass market average. This accompanied by higher levels of loyalty and advocacy towards luxury brands. Last year, luxury goods sales worldwide exceeded US$318 billion, representing a year-on-year increase of over 3 percent. Despite the growing popularity of luxury goods in India, it is unlikely the country’s luxury goods market will catch up to China’s anytime soon – China’s luxury car market is nearly 30 times that of India’s, and India’s luxury market as a whole (US$6 billion) isn’t even a fourth of China’s (US$25 billion). 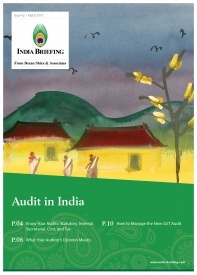 In this issue of India Briefing, we focus on the dynamics driving India as a global trading hub. Within the magazine, you will find tips for buying and selling in India from overseas, as well as how to set up a trading company in the country.